Counting On Season 8, Episode 1: It’s All Greek to Me! The episode opens with a voiceover from Jessa to remind us viewers exactly where we are in the TLC timeline. Life is busy, as always: Jinger and Jeremy are still living in Laredo, Joy and Austin are having a baby (Joy is 5 months along), Joe and Kendra are newlyweds about to embark on their honeymoon, Jana is “doing her own thing,” John-David spends lots of time flying, and it looks like it’s Josiah’s turn to court, because Jessa “has a feeling” that he is seeing a special someone. As for our narrator herself, Jessa takes the opportunity to firmly establish herself as the wise, married sister- after all, with Josh and Jill out of the running, and Jana and John-David still unmarried, Jessa and Ben’s three years of marriage, two children, and willingness to toe the party line make them the model standard for The Duggar Brand. The first scene is at the main Duggar home, where twins Jeremiah and Jedediah inform us that Josiah has started to use more deodorant, which apparently is not just a matter of basic hygiene but rather a sign of his impending courtship. The camera watches Josiah groom himself in front of the mirror in the boys’ dorm for a moment, where we can see multiple sets of bunk beds in the background, and even a mattress on the floor. Now that even the youngest Duggar boy is a teenager, it must have been jam-packed in there, even with Josh and Joe already out of the house at the time (and maybe even John-David if the rumors are true). The photo frames next to the mirror are crooked, but Josiah doesn’t seem to care- his mind is on LAUREN. Lauren Swanson is Josiah’s “special friend,” and today Josiah plans to ask her to court, which is !shocking! news for those of us who didn’t know that Josiah and Lauren are already married. Josiah explains that the Duggars have known the Swanson family for “about 7 or 8 years,” after meeting when the Swansons visited the Duggars’ home church. The Swansons’ visit to the Duggar home is documented in the 19KAC episode “Duggars Do Dinner,” which aired in September 2010, and Josiah also mentions that the Duggars have seen the Swanson family several times since then at “multiple other conferences.” It’s probably safe to assume that Josiah is referring to family conferences held by the IBLP, which the Duggars attend frequently, but for the cameras he keeps it vague. As Josiah heads down the TTH stairs, he shares his plan to surprise Lauren. He has asked some of his older sisters to help by taking Lauren out for a meal, and then he will show up at the end for dessert (which he loves, apparently!) and ask her to court. He’s “a little nervous,” and we are left in suspense as he heads out the door and the scene changes to the Swanson family’s Very Large, Very Nice home. Lauren herself opens the door to welcome Jana, Jessa, Joy, and Kendra in- Jill of course, is nowhere in sight. Lauren introduces herself and reiterates what Josiah has already told us about their families having known each other for several years. She also mentions the fact that her family has coincidentally just moved to Arkansas, although she doesn’t give a clear reason for the move. At this point, Jessa the narrator jumps in to list the similarities between the Duggar and Swanson families- they both have lots of kids, and they homeschool. It probably also helps that they are both members of the same religious cult, but Jessa doesn’t really touch on that. The group is already seated- water with lemon all around- and Lauren is not-so-discreetly positioned at the head of the table, where she gushes over how the Duggars have made her feel at home, and they gush right back and tell her how happy they are to have her there. Jessa makes the pointed remark that “one particular person especially is glad to have y’all closer” and Joy takes the opportunity to crack a joke: “That’s me!” she exclaims, and everyone titters, because of course it’s JOSIAH who is the happiest to have Lauren nearby. Moving the conversation along, Jessa candidly asks Josiah and Lauren where they see themselves in the timeline of their relationship- so presumably, this “special friend” stage appears to count as part of their overall journey to the altar. Lauren says she feels like they are “ahead in their relationship more than what they are,” which doooesn’t really answer the question. Cut to Lauren’s talking head, where she tells us that she noticed Josiah’s interest in her when they were helping prepare for Joe and Kendra’s wedding, which TLC helpfully reminds us was in September 2017 (for reference, based on Joy being 5 months along at this point, this episode was probably filmed in October 2017). Jessa asks Lauren if her and Josiah video chat, to which Lauren replies, “Yes, we did it for five hours one day.” Kendra erupts into giggles, and all Jessa can say is “wow.” Lauren, I think you win best line of the episode. Jessa’s talking head interjects for a moment to discuss her own courtship experience- apparently she preferred talking on the phone over video chatting, because her phone conversations with Ben were not chaperoned. We learn that Lauren’s family has only been in Arkansas for two weeks, but it sounds like she and Josiah have managed to squeeze in lots of time together already. Joy’s talking head tells us that Lauren is levelheaded, she is not a drama queen, and that while she has a sense of humor, she can also be serious- cue more tittering as Lauren says that while she laughs at Josiah’s jokes, she tells him when they aren’t funny. Next, Jana gets a turn to describe Lauren: she’s organized, she tells it like it is, she likes to have fun, and again, she laughs at Josiah’s jokes. Next we get to hear “advice for courting” from Joe and Kendra, which turns out to be foreshadowing for the next segment of the episode. Kendra says “enjoy the moment” and Joe adds, “you only get to do it once, might as well enjoy it.” Kendra concludes with the prediction that while it’s a fun stage, she can see marriage around the corner pretty fast for Josiah and Lauren, punctuating her input with a giggle. This prompts Josiah to ask Lauren, “Do you think we’re gonna go fast or really slow?” to which she replies that it’s up to him! Josiah says that he wants to make sure they get to know each other “enough” and that when the time comes, they’ll know. As Joe and Kendra roll their bags into the airport, Joe states the obvious and says that this trip will be different than the other international trips he has been on, because this time he’s traveling alone with Kendra versus some or all of his family. Kendra says she’s never been this far from home, although she has been as far as Central America. And of course, they’ve certainly never traveled alone together- Kendra tells us that the first time they were alone together, it did feel strange, but they got used to it after a few days. Joe and Kendra board the plane, and they kiss as they settle in to what look like pretty nice seats. Kendra says that it’s been nice to practice kissing and “not just hold hands”- “the whole kit and kaboodle,” she says, giggling, as they give each other a meaningful glance. “We enjoy being married,” Joe agrees. On their first day in Greece- specifically, Athens- Joe and Kendra begin their day by visiting Mars Hill, a biblically significant historical landmark. Kendra seems surprised that the inscription on the plaque is written in Greek, and Joe gets his first opportunity to say “it’s all Greek to me,” which apparently won’t be the last time, because TLC marks the statement with a “ding!” to let us know that they’d be counting. 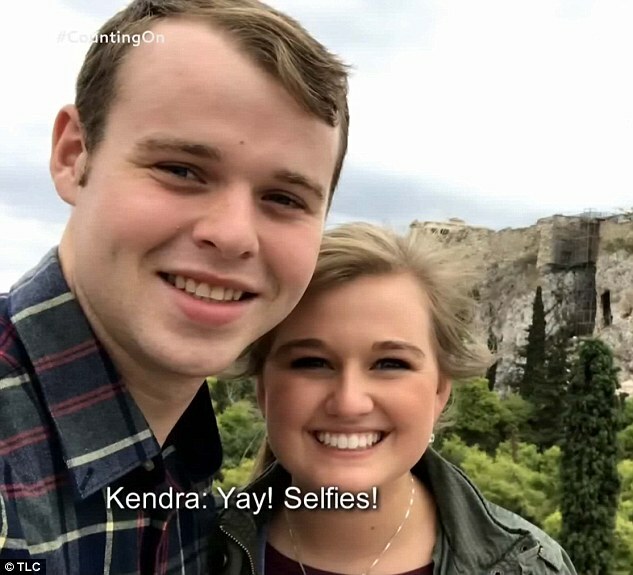 They take a selfie with the Acropolis in the background, and Kendra says that they take a lot of selfies now because they no longer have a chaperone with them to take their picture. A disembodied producer asks talking head Kendra if she ever misses having chaperones around, and she answers that while having a chaperone “can add a different dimension” to the relationship and “you can have a lot of fun with them,” it’s “super exciting and special” to be able to spend time together alone. Next, Joe and Kendra head to lunch, and not just at any restaurant- they are having lunch in the sky, by way of a crane-powered contraption that lifts diners up as they eat. Apparently, neither of them are scared of heights; in fact, Kendra says it’s “thrilling.” (It definitely looks like an amazing experience, adding this to my bucket list now!) Their position in the air gives them a great view of Greece, and we are treated to another round of “TLC producer asks the Duggars a question that none of them know the answer to”- in this instance, Jeremy, at least, is able to name Zeus as one of the Greek gods, and Josiah throws out the name Hercules, but Ben really blows it out of the water and names five. Once lunch is over, the scene changes to Laredo, Texas, where Jinger and Jeremy are headed on a date to take an art class. Jinger says that she was really nervous, because she thought that she would be out of her comfort zone, and they certainly do hit the ground running with a challenging task: drawing each others’ faces! Boy, is TLC good at creating drama out of absolutely nothing. They stretch out the storyline even further by asking some of the Duggar siblings and spouses to draw portraits of each other on whiteboards, and hilarity ensues. The whiteboard drawings, predictably, are mostly various shades of awful, although Ben and Jessa did give it some effort. Jessa calls herself a cougar, and back in class, Jinger avoids critiquing Jeremy’s work. Do they have potential? Yes, says the art teacher, they just need to practice. Back in Greece, it’s time for another meal, and this time Joe and Kendra are planning to take a walking food tour. They’re going to take the subway to get there, and they quickly run into a bit of a language barrier when they arrive at the station. The signs are in English, but it takes them a few minutes to figure out how to switch the language on the screen used for ordering tickets. Joe and Kendra evidently haven’t become tired of holding holds yet, and they stay firmly connected as they push through the turnstiles. Joe asks for directions- he’s not afraid to even though he’s a guy, he says!- and a helpful gentleman shows them where they need to go. Kendra has never been on a subway before, and she says that she “hasn’t experienced a whole lot,” which is probably a lot more true than she realizes. Next, their guide warns them that they are heading to “a vegetarian’s nightmare,” which elicits a giggle from Kendra. They head into a meat market, and it looks like the guide wasn’t kidding- there’s raw meat everywhere, and according to Kendra, the smell was “pretty rank.” The guide points out various types of meat, including tail, liver, brains, tongue and- !shocking word alert!- testicles, which makes Kendra giggle even more- that’s what this episode really needs to start counting! (We’ve only heard “it’s all Greek to me” three times so far, and the third was from a producer, not Joe). From the meat market, they walk to the vegetable market, and this time Kendra is the more adventurous one. She tries an olive, and when Joe says that he’s never really liked them, it’s her turn to tease him by kissing him right afterwards. Their tour guide gives them a list of ingredients that they need to find to make a Greek salad, which they gather with her help, and then they head into what looks like a little shop to put it all together. The guide (I’m starting to feel bad about not getting her name, I just didn’t want to butcher it!) asks Joe and Kendra who does the cooking at home, which makes them laugh, because Kendra is the woman and of course SHE does it, duh! Joe says Kendra is the better cook, and when the guide suggests that now he might be able to help out in the kitchen, they just laugh again and Joe says, “oh my, I don’t know how I’d do there!” Aren’t fixed gender roles just so hilarious!? To my delight, Kendra says the guide’s name again, giving me a chance to look up the spelling. I believe her name is Eirini, which means peace in Greek. We also learn that a Greek salad never has lettuce in it, which I did not know! Joe and Kendra mix the ingredients together with gloved hands (a very romantic thing to do on your honeymoon together, says Eirini), and then they dig in. The honeymoon isn’t over yet, and in the next scene, Joe and Kendra are onboard a ferry on the way to Santorini, one of the Greek islands. Joe tells us that they opted to travel via boat versus plane because it’s part of the experience, and I have to agree- it looks beautiful. As they drink coffee and look out at the water, talking head Kendra shares what she has learned about Joe so far: he is a deep sleeper (okay, normal)…aaand that he likes to lick his plate when he finishes his food, which is not a fact I expected (or wanted) to learn. Kendra says she’s asked him not to do it in public, but it sounds like he still does so at home, because she tells Joe that he probably wants to start working on breaking the habit so that he doesn’t set a bad example for their future kids (foreshadowing, anyone?). With a sheepish smile, he defends himself by saying that he’s not the only one in his family that does it, and Kendra says, “I’m sure you’re not!” And who was the sibling who taught Joe to lick his plate? Jessa! As Joe and Kendra arrive in Santorini and settle into their resort, viewers are hurtled back to Jessa’s home in Arkansas for a Seewald family update. Ben is still in school with one year left (he takes classes online through the Moody Bible Institute), and Spurgeon and Henry are growing up, as children do. Ben walks in the door with some grocery bags, which we learn hold ingredients for a special dinner. It’s Ben and Jessa’s third anniversary, and Ben plans to cook dinner and watch the boys while Jessa goes out for a mani/pedi with her sisters. He also tells us that he has designed a necklace for Jessa for an additional surprise. Luckily for Ben, Spurgeon is down for a nap when Jessa heads out the door, but I sense some “dad’s watching the kids alone!” antics ahead. Back in Greece, Joe and Kendra hop into a 4×4 to drive around, which I kind of suspect was more Joe’s idea than Kendra’s, but if her giggles were any indication, she enjoyed it, too. They stop at a beach to go paddle-boarding, and the sand is black- Joe has never seen anything like it, but Kendra knowledgeably explains that the sand is an exfoliant. Getting into the water, it is clear that Joe, and especially Kendra, are wearing very modest swim attire, but at least Kendra’s dress doesn’t look bulky like some of the “wholesome” swimwear we have seen the Duggars, etc. wear in the past. 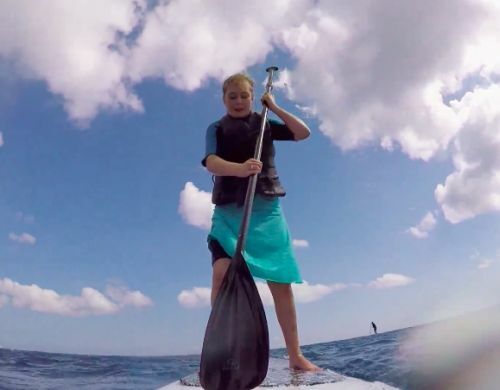 The windy ocean air creates lots of waves, which makes it difficult for them to stand up on their paddle-boards, and we see multiple shots of both Joe and Kendra falling into the water. They do sort of get the hang of it by the end, but they both agree that paddle-boarding would be easier on a lake. Flip-flopping once again to Arkansas, the next scene opens at a nail salon, where Jana, Joy, and Jessa are getting pedicures as part of Ben’s anniversary gift to Jessa. They chat about how “crazy” it is that Ben and Jessa have already reached their third anniversary, and Jessa says it’s been a “whirlwind.” Joy asks Jessa, “Ben has both of the boys? AND he’s making supper?” as if Ben was out singlehandedly building a rocket ship and watching 100 children at the same time. Cut to the Seewald home, where adorable Henry scoots across the floor in the living room while Ben pokes around in the kitchen. Spurgeon is still napping, so Ben rolls up his sleeves and gets to work. For dinner, he is preparing a salad and cooking some quinoa and steak, but with Henry making his way into the kitchen and demanding attention, Ben says, “this is going to be a little harder than I thought!” Isn’t putting a man in the kitchen and asking him to watch his own child just SO wacky and hilarious!? Ben tries to distract Henry with the pack and play, but he isn’t having it, so next Ben tries putting Henry into his highchair, which seems to do the trick. After munching on some cereal, Henry’s eyes droop shut and he falls asleep right there at the table- and Ben carefully wedges a stuffed animal between Henry’s head and the chair next to him to make him comfortable without waking him up, which is genius. 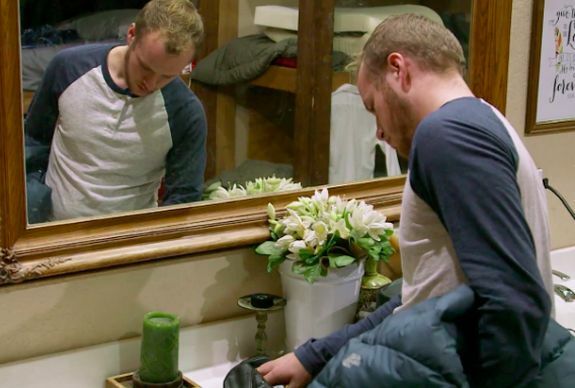 I don’t think Ben is as helpless around his children as TLC is trying to make us believe. Meanwhile at the nail salon, the Duggar sisters are watching Joy’s belly move while they get their pedicures, which gives talking head Joy an opportunity to update us on her pregnancy. She hasn’t had any morning sickness or weird cravings, but she is tired a lot. Talking head Austin says that it’s slowly sinking in that he’s going to be a dad, but it hasn’t fully hit him yet. Jessa asks Joy about how she thinks Austin would handle keeping a baby on his own, and Joy says that he has only changed one diaper- talking head Joy chimes in to tell us that Austin’s only has one sibling who is older than him, which explains his lack of diapering experience. Jessa is clearly the one in charge of moving the conversation along, and as the girls leave the nail salon she also narrates, taking a moment to reflect on the passage of time. At the Seewald house, both boys have woken up from their naps just in time for Jessa to arrive home. She tells us that while she’s not surprised that Ben was able to multi-task, she is surprised that Henry did so well, because he has a hard time being away from her. Everyone seems happy to see her, and they all sit down at the table to eat while talking head Ben lists some of the qualities that make Jessa a good mother: she has a lot of patience, she’s gentle, and she’s caring. Ben puts a cartoon on his phone for Spurgeon to watch, and then Joe and Kendra’s talking heads tell us that they admire Ben and Jessa because they put each other first and help each other out. Kendra makes a point to say “it’s not just mom doing everything,” and maybe it’s just me, but her comment appeared to make Joe a little nervous. As Ben and Jessa eat their dinner, they briefly reminisce about the past three years, and the producers ask them the question, “How is marriage different than you thought it would be?” Ben responds that it isn’t all just butterflies and romance, but also “just doing life together”- there are ups and downs. Jessa chimes in to say that they have arguments that they have to work through, and she also mentions “everything my family walked through years ago,” which I assume is a reference to Josh. They briefly tease the possibility of having more kids, and Jessa talks about what having children has added to their relationship. “I’ve fallen in love with him even more than I could imagine was possible,” she says. It’s finally time for Ben to surprise Jessa with the necklace that he designed for her, and he places a light blue box on the table in front of her. Jessa jokes, “Is this dessert?” as she opens the box, and either she had seen it already and her reaction was staged, or she didn’t actually like it, because she had seemed more excited earlier about the steak than she does now about the necklace. For Ben’s sake, I hope that my impression is wrong, because it really did seem like he put a lot of thought into the gift. 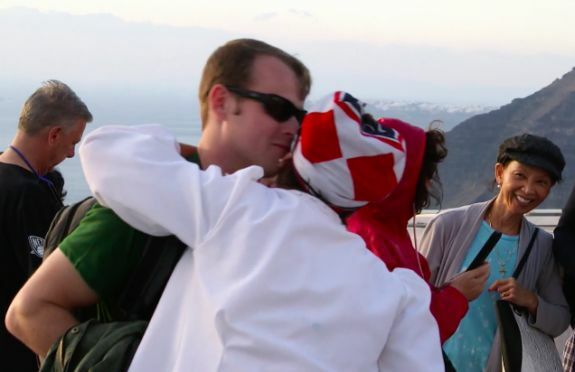 Across the ocean, Joe and Kendra’s Greek honeymoon is finally coming to an end. In their last scene, they are exploring the town of Thira when they run into a local theater group. Joe and Kendra stop to watch the singing and dancing and end up briefly getting swept into the performance, which wouldn’t be significant at all except for the fact that one of the female performers gave Joe several kisses on the cheek. Because this is the Duggars, this requires a quick explanation of Greek culture from Joe to assure us that no, he wasn’t unfaithful to Kendra. With the encouragement of the performers, Joe and Kendra smash some plates on the ground and shout “Opa!,” and just like that it’s time to start thinking about heading home and getting back to everyday life. And what, exactly, does everyday life have in store for Joe and Kendra? “Do you guys think you’re gonna be having a baby soon?,” a producer asks, and Kendra says that she’s not pregnant right now, “that she knows of”- but only because she hasn’t taken a test. Guess we’ll have to wait until the next episode to find out the news that we already know! Is it Jack and Rose? No, it’s Joe and Kendra Duggar! I’m a married, stay-at-home mom of two boys. I’m in my twenties, and I even have a nose piercing- sound familiar? Unlike Jill (Duggar) Dillard, however, I’m not a fundamentalist Christian. I did grow up in a strict Christian (Baptist) home, but I left the church when I was a teenager, and my life now is probably what Jill’s would look like in a parallel universe. Follow my new blog as I discuss religious fundamentalism, the Duggar family, and the TLC show Counting On.